Our client asked us to design a low-maintenance, dog-friendly space that incorporates the beautiful artifacts collected by the owner from his extensive world travels. The high ceilings in this home, while beautiful, created a design challenge by creating a massive volume of empty space. Our client is a successful business man who travels the world; he brings home exquisite artifacts which represent the culture of the countries he visits. Our challenge was to create a sophisticated residence which highlighted his unique urban town home on the water, yet allow Ryder, his dog, to roam free. Our solution was to create soffits in the ceiling with enhanced lighting plans and incorporate beautiful wood panels to provide a feeling of intimacy in the large room. The 10 foot ceilings on several floors provided visual drama, but made the rooms feel empty. We detailed each ceiling area as part of the solution - to make the rooms intimate. The master bedroom has an antique panel on the ceiling. The great room-has a large soffit integrating wood panels with 3 lighting sources. The foyer and dining were finished with rock crystal / iron chandeliers. 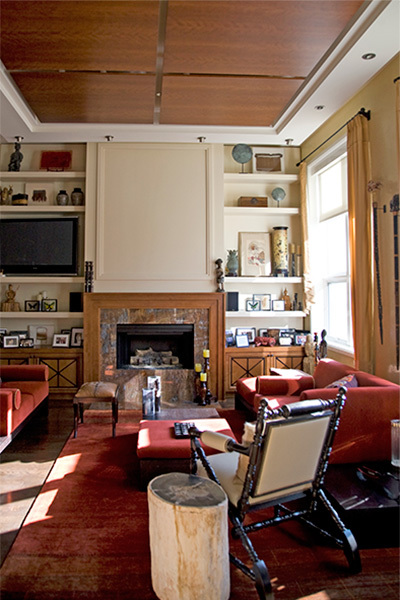 Custom millwork not only adds a design element, but also a space for the television and additional display space for the home owner’s treasured artifacts. Rich Venetian plaster treatment to the walls creates depth and shine to reflect the beautiful river views. Custom moldings with antiqued mirror insets adds visual interest while still allowing art to shine. Use of solution dyed Indoor/Outdoor fabrics ensures durability even with pets and heavy sunlight. 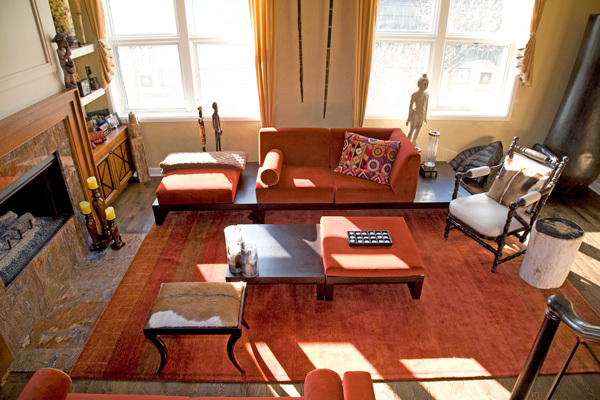 Asian artifacts and furnishings balance the contemporary architecture and reflect the home owner’s personality. Asian hand knotted rugs-are everywhere. They clean and wear well while enhancing the space. Fabrics look like luxury-but are in fact solution dyed. What is solution dyed fabric mean? The fabrics are called indoor out door fabrics but actually feel like soft velvet. "Deb sets very high standards for both the process and the end result. She really cares. I don't think she'd ever be capable of doing a mediocre job."